Summary: uBid offer brand name merchandise at deep discounts. Save money today with uBid. 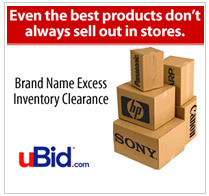 uBid.com offers brand-name merchandise at deep discounts, most auctions start at $1 and come with manufacturer warranties. Registrants can save up to 70% on computers, consumer electronics, jewelry, home goods, and much more. If you are looking for quality products at wholesale prices, uBid.com is the ideal place for you.